Included is a small stand, the box, styrofoam, papers & Certificate Of Authenticity. The papers have creases. This is in very good condition. It has been on display in a room. 1955 Cadillac Fleetwood Limited Edition. All complete on this uniquely detailed diecast model car with lots of unique features. Manufacture - Franklin Mint. No boxes or paperwork included. All cars are in mint condition. Franklin Mint 1932 Cadillac V-16 Sport Phaeton 1:24 Scale Die-Cast w/Box. Condition is Used. in good shape. 1932 Cadillac V16 Sport Phaeton - Elliot Ness. FRANKLIN MINT Diecast car. Up for sale is a Franklin mint 1959 caddy convertible part of a 500 pc. collection always kept in glass display cases. 1953 CADILLAC EL DORADO white/red. 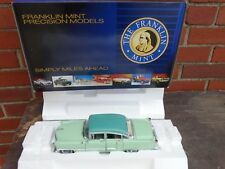 FRANKLIN MINT Diecast car. The item is in good condition, the paint on the doors have peeled off and/ is chipped and wrinkled. All other areas are excellent. Very clean. A great addition to any collection! Precision engineered 1:24 scale die-cast replica hand assembled from over 200 separate components and hand finished was available exclusively through the Franklin Mint.there were only 5900 made and this is # 4525 with a certificate of authenticity. '1953 White Cadillac Eldordo Convertible w/ Top". 1989 Franklin Mint Precision Models. 1/43 scale 1959 Cadillac ElDorado Convertible by The Franklin Mint in great condition. 1989 FRANKLIN MINT PRECISION MODEL~CAR~CADILLAC EL DORADO New With Foam. Condition is New. Shipped with USPS Priority Mail. 1932 Cadillac V-16 Sport Phaeton (Car not included). Franklin Mint. Paperwork For 1:24 scale diecast cars and trucks, paperwork and brochures. Handling & Care Instructions. Color Brochure (Folds out to 11.75" X 19.5"). 1953 CADILLAC ELDORADO CONVERTIBLE LE 972/9900 FRANKLIN MINT 1:24 DIECAST WITH DISPLAY CASE 2000. CADILLAC 1953 ELDORADO CONVERTIBLE. REALISTIC CAR DETAILS INCLUDE RED AND TAN EXTERIOR WITH MATCHING DETAILED INTERIOR. COMPLETE WITH DISPLAY CASE. SCALE 1:24. 12"L x 7"W x 6"H.
New in styrofoam packaging, only opened for photos. COA included. Due to the long shelf time of our items, we cannot guarantee that they are in mint or perfect condition. Items are “as is” when received. Please thoroughly check photos. We are happy to send additional photos upon request. 1932 Cadillac V-16 Sport Phaeton (Car not included). Franklin Mint. Paperwork For 1:24 scale diecast cars and trucks, paperwork and brochures. Handling & Care Instructions. Includes the following. Brochure For Color Brochure folds out to 9.75" X 17". Franklin Mint. 1:24 scale diecast cars and trucks, paperwork and brochures. 1:18 scale. 1:43 scale. 1:25 scale promo cars. Includes the following. 1953 Cadillac Eldorado Convertible. Brochure For Color Brochure (Folds out to 17" X 33") Lot Franklin Mint White. The 1:16 Scale. 1:24 scale diecast cars and trucks, paperwork and brochures. 1:25 scale promo cars. Franklin Mint. Paperwork For 1:24 scale diecast cars and trucks, paperwork and brochures. 1:18 scale. 1:43 scale. 1:25 scale promo cars. Handling & Care Instructions. 1932 CADILLAC V-16 FRANKLIN MINT Precision Model Car. Cadillac is owned by General Motors. 1957 Cadillac Eldorado Brougham (Car not included). Franklin Mint. 1:25 scale promo cars. cars and trucks from various manufacturers. 1:43 scale. and trucks from various manufacturers. 1:18 scale. 1:24 scale diecast cars and trucks, paperwork and brochures. 1959 CADILLAC ELDORADO. FRANKLIN MINT 1/43RD SCALE. CLASSIC CARS OF THE 50's. THIS MODEL HAS NO BOX. 1/43 Scale Diecast Model by Franklin Mint. Scale 1/43. MINT - The item is in perfect condition. SPARES or REPAIR - The item will be in a poor condition. EXCELLENT - The item will have had very careful use, with only small imperfections. Very Rare Model. Only Opened Once For These Photos. A Franklin mint scale model of a 1910 Cadillac model 30. scale is 1/ 24. This model hasopening bonnet with highly detailed engine, opening doors, opening rumble seat, The front wheels steer and all roll. A Franklin mint scale model of a 1932 Cadillac V16 Sports phaeton. boxed with paper work. but you never know. 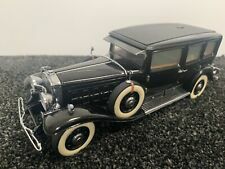 A Franklin mint scale model car of a 1930 Cadillac LWB Imperial V16, Al-capone. Condition is like new.From original box into a Perspex case with walnut base.Has the original Tommy gun etc Dispatched with Royal Mail 1st Class. Fabricant Franklin Mint. state / condition: new with hood, Lightweight discoloration, white paint 9,5 / 10. Couleur dominante Blanc. Couleur blanc. Echelle 1/24. The 1912 Model 1912, 1913 Model 1913, and 1914 Model 1914 were similar but used larger engines. They precision engineer everything! More working features than anyone else. They're heftier. 6 Reasons Why Franklin Mint Precision Models Leads The Way In Die-Cast Collectibles. Franklin Mint 1:24 1910 Cadillac Model Thirty 1:24 scale near mint condition car sadly missing original polystyrene box and outer box, never been on display. PLEASE STUDY THE PHOTOS AS COMPRISE PART OF DESCRIPTION.